Back in Val this week! Been a crazy cool week! Got paid to do nothing but ride! No guests, so I had the week off! Took first lifts up with a friend on Monday! 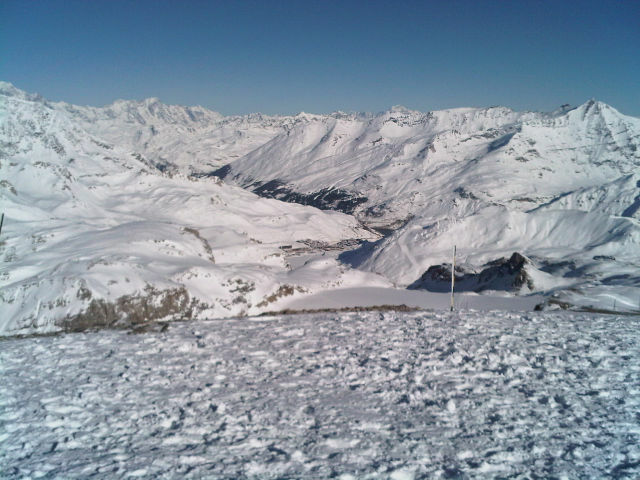 Half a meter of fresh powder and perfect blue bird conditions! Dropped off the back Grand Prix! Awesome little mountain! Got some sick fresh tracks Slashing the powder, found a few drops, nothing too big, about 2 meters! All was going well until I took a wrong turn and ended up in a small valley! I couldn’t ride out so ended up hiking it! An hour later I managed to get out, had a little panic attack but survived in the end! We spent the rest of the day hunting pow! Awesome start to the week! Tuesday bought another blue bird! Spent the day looking for jibs and we made our way to the highest point of the ski area, Grand Mott! (See pic. 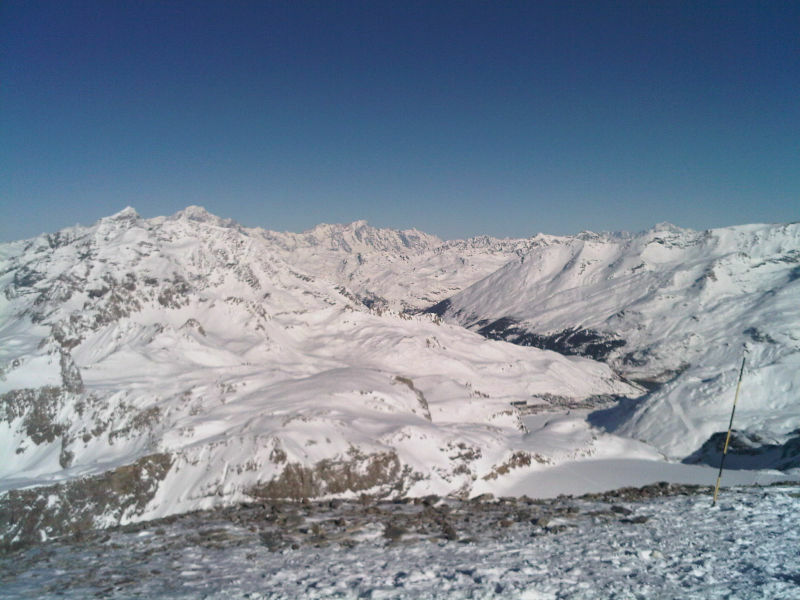 attached) amazing view from there! Mountains seem to go on forever! Ended up at an apres ski bar on the slopes, the ‘Follie Douche’, awesome little bar that kicks off at 2 and they’ve got live banging music until 5! 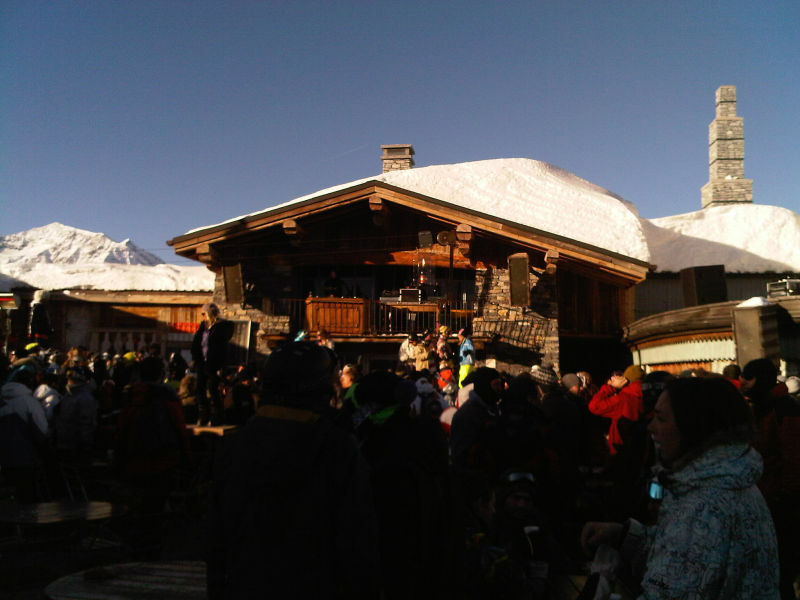 Great place to start your apres! Spent some time there, had a few drinks and then came down the mountain and started the apre session proper! Always a fun time! Woke up on Wednesday to find everything white, the snow still dumping down and feeling a little hung over! So spent the day chilling out! We did a huge pub crawl through Val, which got a bit messy! In Val you know its a good night when you end up in dicks t-bar! One of the three night clubs in Val! Real cheese ball of a party but fun! Drinks are cheap for seasonaires, one of the bonus’ about doing a season, are the discount drinks in all the bars! This helps a lot when you realise how expensive they all are! Thursday was a half day, only got up at about 12, still had a fun day on the mountain! On Friday didn’t go up at all! Had to make sure a friend didn’t pass out! Came off a kicker, tried a 3 and over shot the landing and landed on his head! He had some major concussion! What a sick week! Blue bird almost every day and 2 awesome powder days! But the paid holiday comes to an end! We’ve got 5 russians in this week, one of them speaks english and I’m sure two of them are hookers!! So should be an interesting week! Anyway I’ll catch you all on the flip side and remember, riding is all about learning tricks with you friends! There’s an Atmosphere in Hood!! Ha ha nice one bruv.